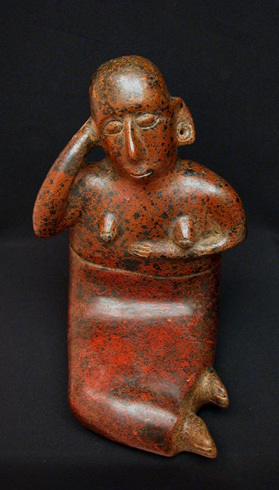 A Colima Lady, Protoclassic, 100 B.C. to A.D. 250. This outstanding example of a high ranking personage, in the Comala style of the Colima Sculptural tradition, is seated in a demure pose with her hand held to the side of her head, her ears adorned with incised ornaments, her legs held together below a beautifully modeled skirt with subtly protruding feet. This is the type of sculpture that probably influenced the work of many 20th Century artists, such as Henry Moore. Provenance: From the distinguished personal collection of the late Allan Long, New York.